One of Calgary’s newer funeral homes, The Chapel of the Bells is specially designed to meet the needs of a variety of funeral services. The Chapel, with stunning stained glass display, accommodates large or small gatherings. The location also offers a beautiful reception room complete with fireplace and full-service kitchen for the family’s use after a service, a funeral home lounge area where families can gather in a home-like setting, a covered marquee for vehicles to guard against inclement weather, and a crematorium on site. McInnis & Holloway’s Chapel of the Bells location in north Calgary houses the Olive Branch Grief Resource Library. Available to all families and community groups, our library contains books, publications and videos on a variety of topics related to death and grief. Information booklets are available free of charge, and books and videos are available for a two-week lending period. Additions are always being made to the library, so visit us at 2720 Centre Street North in Calgary (Alberta) for the complete selection. 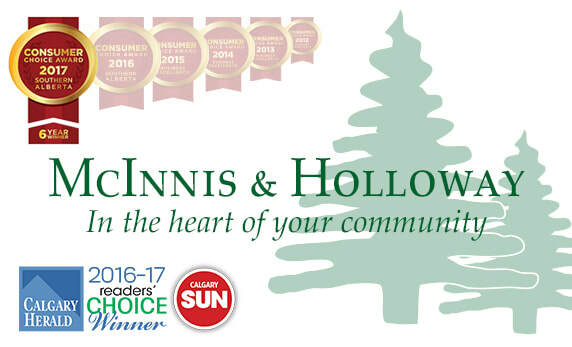 McInnis & Holloway Funeral Home Ltd. Is Proud to be the 6-time consecutive winner of the Consumer Choice Award for Business Excellence. The loss of a loved one is a difficult time for everyone. Working with a funeral home that offers trusted, compassionate and professional care will make a difficult time much less stressful. McInnis & Holloway Funeral Home has a proven record of customer service, products and a variety of facilities and service options to meet your specific requirements. This family owned funeral home is experienced in working with specific religious and ethnic requirements for funeral arrangements, which can simplify the planning and organization of the funeral itself. McInnis & Holloway Funeral Home first opened 114 years ago in 1903 and the values of care and compassion that started the company are still the key elements for the business today. The management team of Ernie Hagel, his son Jeff Hagel, Janine Altamirano and the licensed professional staff are dedicated to assisting families in very difficult times. The company prides itself on professionalism, empathy and quality service with compassion. McInnis & Holloway Funeral Home has eight locations in Calgary, Cochrane & Airdrie and our highly professional staff are available 24 hours a day to provide service and information and together we were voted best of the Funeral Home in Calgary as voted by Calgarians.